A magnified image of the new biosynthetic silk. Image: Christopher Bowen. Spider silk is among the strongest and toughest materials in the natural world, as strong as some steel alloys with a toughness even greater than bulletproof Kevlar. Spider silk's unmatched combination of strength and toughness has made this protein-based material desirable for many applications ranging from super-thin surgical sutures to projectile-resistant clothing. Unfortunately, due to spiders' territorial and cannibalistic nature, their silk has been impossible to mass produce, so practical applications have yet to materialize. As an alternative approach, scientists have tried creating some forms of synthetic spider silk, but have been unable to engineer a material that includes the majority of natural silk's impressive physical traits. Until now. Researchers in the School of Engineering & Applied Science at Washington University in St. Louis have engineered bacteria that produce a biosynthetic spider silk with a performance on par with its natural counterparts in all of the important measures. And they've discovered something exciting about the possibilities ahead. The new research, reported in a paper in Biomacromolecules, reveals that the tensile strength and toughness of spider silk remains positively correlated with its molecular weight – the bigger the molecule, the stronger the silk – even for synthetic silk with a weight nearly twice that of the previous record-holder. "People already knew about this correlation, but only with smaller-sized proteins. We found that even at this large size, there is still a very good correlation," said Fuzhong Zhang, an associate professor in the School of Engineering & Applied Science. One of the biggest historical challenges in producing a biosynthetic spider silk has been creating a large enough protein. The challenge was so big, in fact, it required a whole new approach. "We started with what others had done, making a genetically repeated sequence," said Christopher Bowen, a PhD student in Zhang's lab. The DNA sequence was modeled after the sequence in spiders responsible for creating the silk protein. In theory, the more repetitions of this sequence, the bigger the resulting protein. After the DNA sequence reaches a certain size, however, "the bacteria can't handle it, they chop the sequence into smaller pieces", Bowen said. It's a problem that has been encountered many times in previous efforts. To get around this long-standing obstacle, Bowen and co-authors added a short genetic sequence to the silk DNA that promotes a chemical reaction between the resulting proteins, fusing them together to form an even bigger protein, bigger than has ever been produced and purified before. "We made proteins basically twice as large as anyone's been able to make before," Bowen said. Their silk protein chains had a molecular weight of 556kDa. Previously, the largest biosynthetic spider silk protein had a molecular weight of 285kDa. Even natural dragline silk proteins tend be around 370kDa, although there are a few larger outliers. 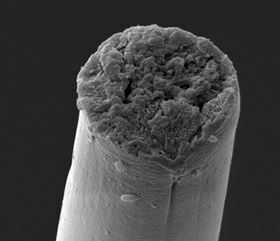 Bowen and his co-authors subsequently spun their exceptionally large biosynthetic silk proteins into fibers about a tenth the diameter of a human hair and tested their mechanical properties. This biosynthetic silk is the first to replicate natural spider silk in terms of tensile strength (the maximum stress needed to break the fiber) and toughness (the total energy absorbed by the fiber before breaking), as well as other mechanical parameters such as elastic modulus and extensibility. Going forward, Zhang's lab is looking to position biosynthetic silk fibers as a replacement for some of the myriad of petroleum-based synthetic fibers used across industry. "We will continue to work on making the process more scalable and economical by making it easier to handle, reducing the amount of chemicals needed, and increasing the robustness and efficiency," Zhang said. The Zhang group also plans to further explore the limits of their new approach. In addition to producing the first biosynthetic silk fibers to fully replicate the performance of natural spider silk, their work strongly suggests that the strength and toughness of these fibers will continue to increase if even larger proteins can be produced. This story is adapted from material from the Washington University in St. Louis, with editorial changes made by Materials Today. The views expressed in this article do not necessarily represent those of Elsevier. Link to original source. Scientists have developed a method for pulling super-stretchy and strong fibers with properties similar to spider silk out of a hydrogel.